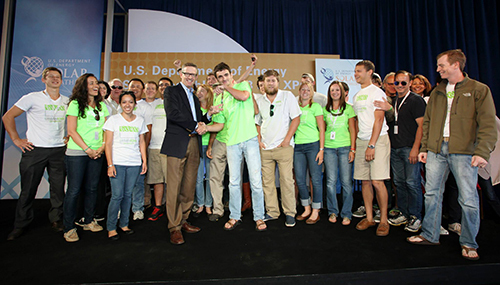 The UNC Charlotte team, Team North Carolina, brings home two awards from its participation in the US Department of Energy Solar Decathlon 2013, which concluded Sunday, October 13, in Irvine, California. UNC Charlotte tied for third place in the juried Engineering Contest and won the popular-vote People’s Choice Award. UNC Charlotte was one of 19 academic teams that participated in the competition. In a series of 10 contests, the Solar Decathlon challenges academic teams from around the world to build completely solar-powered houses that feature energy-efficient construction and appliances and renewable energy systems. Teams receive up to 100 points in each of the contests, with special awards given for four juried contests: Architecture, Market Appeal, Communications, and Engineering. The team with the highest overall score wins the competition. UNC Charlotte/Team North Carolina tied with Team Austria and the University of Nevada Las Vegas for third place in Engineering. The team’s house, “UrbanEden,” was recognized for the high thermal mass of its geopolymer concrete walls, the capillary tube cooling system, and the moveable racks of photovoltaic panels. For more about UrbanEden’s design and features, visit http://urbaneden.uncc.edu. Team Austria was the first-place winner in the overall competition, with Las Vegas coming in second, and Team Prague from the Czech Republic placing third. For a complete look at scores and results, visit http://solardecathlon.gov. In addition to the point-based awards, the Solar Decathlon includes a People’s Choice Award, which was based on popular voting conducted October 3-11. UNC Charlotte was recognized at the Solar Decathlon Victory Celebration on October 12 as the 2013 People’s Choice Award winner. The UNC Charlotte team is comprised of faculty and students from three different areas: the School of Architecture, the William States Lee College of Engineering, and the Belk College of Business. Generous support for the two-year project of designing and building the house came from a broad array of University units, as well as many private and corporate funders, including Duke Energy and Ingersoll Rand. The team will dismantle UrbanEden over the next week and return the house to UNC Charlotte.